Every person that has been crafting for a while knows that it is important to use the right type of glue to have successful craft projects. You will find a list below of 15 adhesives that should be in every crafter's toolbox. Plan ahead and have the kind of glue you need on hand so that you can always achieve top-notch results with your art and craft projects. 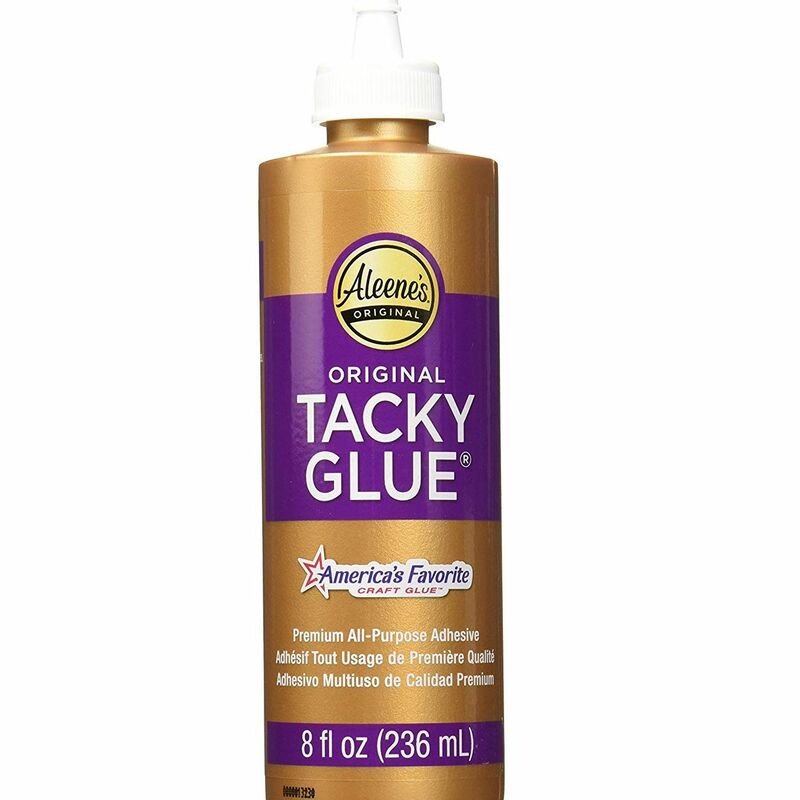 Aleenes tacky glue is the adhesive used most commonly by crafters. This product has been around forever and continues to be beloved by crafters to this day. Your moms and grandmothers probably used it for their craft projects long ago. The original formulation is still available, but you can also buy a fast grab and a quick dry version. The product can be used with fabric, paper, felt and plastic. It dries clear and remains flexible. A glue gun is most likely the tool that every crafter owns. When you buy a glue gun make sure that it fits your hand comfortably, and that the trigger is easy to pull and release. A cordless glue gun is optimal, but if you do buy a gun with a cord make sure it is long enough to suit your needs. A metal stand to rest the gun on is imperative. Use hot glue on porous and non-porous surfaces, but do not expect it to hold in high temperatures or if you need an incredibly strong bond. It does work well with your average craft projects when you need quick and fast adhesion. Always make sure to protect your fingers as glue guns can produce burns if you touch the tip or have hot glue melt on your skin. Glue dots are handy because you don't have to wait for the glue to dry, and they eliminate messes. You can purchase glue dots that are permanent or removable. They are also non-toxic and acid-free. Use glue dots for scrapbooking, photos, greeting cards, gift tags, decorating, home decor, paper projects and more. You can even use glue dots to add bling to your crafts! Glue dots come in different sizes making your crafting possibilities endless. Foam tape is excellent for adding dimension to scrapbook page elements and card paper projects. It is a double-sided tape made from foam and is thicker than regular scotch tape. It creates an almost permanent adhesion with paper but does not work well with other types of craft projects. Just cut pieces of foam tape to the sizes and shapes you desire, place on the back of your cutout or paper and press firmly. Instant dimension and adhesion! Glue pens have tips that allow the crafter to apply a fine line of glue with exact precision. If you are a card maker or work with digital die cuts, you will want to have this tool in your kit. You can also use glue pens for glitter applications to paper projects. Write words or draw line art and cover with glitter to add instant sparkle to your paper projects. Just remember also to put the cap back on as these pens dry out quickly. E6000® Craft Adhesive is the glue often favored by crafters. It can be used to bond wood, fabric, leather, ceramic, glass, metal, paper and more. A plus to this product is that you have about five minutes time to reposition your materials until a permanent bond is secured. This glue is waterproof, flexible, dries white and is paintable after it dries. The one downside to this product is the odor. Make sure to use it in a well-ventilated room or outside. 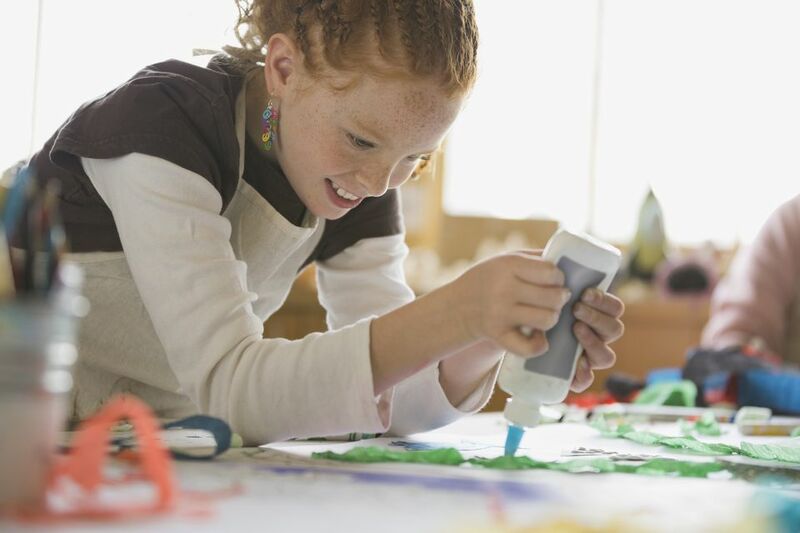 Glue sticks are a must for children's craft projects. They provide adequate adhesion for paper crafts and dry clear. They are not, however, recommended for other types of art and craft projects. If you are a scrapbooker you may be tempted to use a glue stick but don't. Spend the extra money for a higher quality glue and your projects will not only have better adhesion but will last a lot longer. Glue runners are rolls of sticky tape encased in plastic that are used for paper crafting. They are used to bond paper, ribbon, photos and many other materials. The bond is permanent and no drying time is necessary. Adhesive spray can bond paper, cardboard, plastic, films, and foam. Many crafters like to use adhesive spray when working with photos. Just remember that the picture is in place forever. If you want to reuse the photo sometime in the future, consider another type of adhesive. Apply the spray adhesive to your project and then allow the solvent to evaporate before bonding. Once paper etc. is bonded together it is permanent, so make sure you have tested your fit first before applying the spray. It is also important for safety to use the adhesive spray in a well-ventilated area. Remember that adhesive spray is well, a spray. Protect your surface with a drop cloth, or place the item in a paper box and then spray with adhesive. Mod Podge is a product that has been around for years and will continue to be around for more with good reason. It is used as a glue, sealer, and finish. Brush it onto paper, fabric, wood, printed material and more. It is quite popular as a sealer for decoupage projects. Just apply a coat of the glue to your craft project and let it dry. Sand the sealer smooth and apply again. Repeat as many layers as desired. Mod Podge comes in 23 formulations such as outdoor, dishwasher safe, brushstroke, sparkle and even chalk mod podge. There is a product for all of your crafting needs. If you do a lot of work with stencils, you will love repositionable craft adhesive spray. It is an excellent product to use with stencils because it adheres to wood, metals, fiberglass, drywall, fabrics, foams, plastics, glass, rubbers, and much more. ﻿Just spray the back of your stencil and press down onto your surface. Pick it up when finished dabbing paint onto stencil and reposition. The bond will hold for quite a few repositioning steps. Double-sided tape is sticky on both sides. It comes in handy for scrapbooking, card making and other paper crafts. Blue gel glue is a product that was intended for children to use as a school glue for paper projects. It is a blue, gelatinous substance that dries clear. Recently silk artists have started using it as a resist with good success. Who hasn't used duct tape to repair any problem in their home? This product has been popular for years and used to fix the most unconventional of home repairs. Duct tape is strong, sticks to almost anything and doesn't twist. In recent years, people have used duct tape as a craft medium, constructing wallets, purses, flowers and even dresses from this product. Super glue is ideal for heavy-duty projects and repairs. Use it on metal, glass, ceramic, wood and plastic surfaces. The chemical composition ensures a superior bond, dries clear, and no clamping is needed. When used for crafting make sure to take into account that super glue increases in size as it dries so that you may have some swelling in your glued areas. Take precautions when using super glue. It can be difficult to remove if superglue gets on your fingers.